Kolonaki is not a part of the city I walk through very often: it’s super-expensive, super-posh and in my opinion its few redeeming qualities are limited to its summer cinemas, its views over Athens from Lycabettus Hill and the stark, tragicomic contrast it creates with neighbouring anarchist Exarcheia. Blatant, unapologetic big money is just not my style. One fateful day, however, it did so happen that I passed outside Booktique; with the exquisite selection of English books on its front display, it made such an impression on me I promised I would bear returning to Kolonaki just to properly visit it. The first thing I noticed while browsing Booktique was that everything it was selling was just plain stylish: the shelves, the reading sofa, the tables, the decoration… everything suggested that someone with good taste had taken meticulous care of the place. Then the selection itself reaffirmed my initial impression of it: beautiful books in English as well as Greek from all sorts of genres (some of them surprising, all things considered) had me wondering for the better part of an hour whether I should indulge in yet another gift for myself I would scarcely have the time to enjoy. 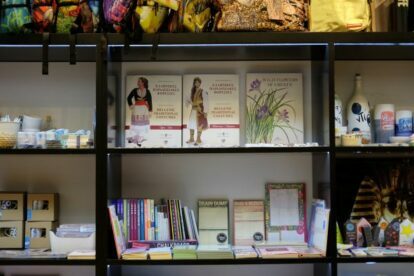 At the end of the day, though, where Booktique really shines is its range of design-oriented Greek-themed souvenirs and gifts. If you’re looking for something pretty and unique to bring back home, have some extra money to spend on something special but are out of ideas, look no further.